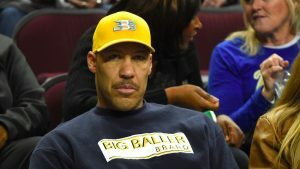 Just a day after outspoken LaVar Bell the father of NBA player Lonzo Ball and suspended UCLA player LiAngelo Ball played down the involvement of President Donald Trump in getting LiAngelo out of China safely without criminal charges, the president blasted Ball on Twitter. Later that same day, Trump continued his claim that Mr. Ball was not grateful for the release of his son. Trump’s tweets came in response to Ball’s interview on ESPN in which he cast doubt on the amount of involvement Trump had in getting his son and two other fellow UCLA teammates released after the three had been arrested during a team basketball trip to China in early November. Mr. Ball responded with, “Who?” after being asked about the involvement Trump had in the release. Ball said that everyone wants it to seem as if Trump helped him to get his son released. When Ball was asked about the Tweets back and forth with Trump, he claimed he did not want to make any more statements, but landed one more. He asked his interviewer if Trump visited the three players in jail and added that if Trump visited them while in jail, he would be the first to thank Trump. LiAngelo and his two teammates Jalen Hill and Cody Riley were arrested for suspicion of committing shoplifting, while visiting China. Trump, who at the time was on a tour through Asia, brought up the case with China’s President Xi Jinping and shortly after the three players received their release and returned to the U.S.
John Kelly the chief of staff for Trump said Trump asked Xi if he knew of the three knuckleheads that were caught for allegedly stealing. The Chinese president was unaware of what happened but sent an aide to find out more about it. Trump, says Kelly, said that he would like to see the incident taken care of expeditiously. Trump was clear through Twitter that he was expecting to be thanked by the three players for his involvement, as he claimed they were facing as many as 10 years in prison, though most legal experts say it was unlikely charges would have been so serious. Once the three arrived in the U.S. they thanked Trump during a news conference and UCLA announced the three were indefinitely suspended from the team.